One of the hidden and apparently subtle changes to the 1% uprating of benefits for the next three years is the definition of Employment Support Allowance (ESA). 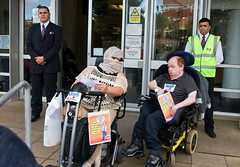 The Government has stated that all disability related benefits are safe from the 1% uprating of benefits. However, look through the detail and you see that this is simply not the case. The Government itself in its own analysis recognises that all people by definition who receive ESA have an impairment. So… the big question is, is ESA now an employment benefit in line with Jobseeker’s Allowance or is it a benefit for disabled people to help them while they look for work? On top of this, the Government has also introduced a 12 month time-limiting of Employment Support Allowance. Disabled people on contributory Employment Support Allowance (includes people who have contributed taxes) and find themselves out of work will lose this benefit if they haven’t found a job within 12 months. This shows total lack of consideration to the effects of disability discrimination and the fact that those who have newly acquired an impairment will spend several of those first few months just adjusting their lives. Posted on January 9, 2013 by Cllr Krupesh HiraniPosted in Disabled PeopleTagged 1% uprating, disability, Disability Benefits, Employment Support Allowance, ESA, Government, Incapacity benefit, Income Support (UK), jobseekers allowance, Support group, Welfare Benefits Up-rating Bill, Working Activity related group.